This month’s kit (drumroll please……) is all about circle die cutting!! If you have been crafting for a while, I bet these types of dies were probably one of the first you used. Actually, I have layering dies in circles, squares, rectangles, hearts and lots more. But, I will tell you, I don’t use them nearly enough! This kit was like a wakeup call reminding me that there are so many things you can do with layering dies. Sara Davies, the owner of Crafter’s Companion, thinks of everything when putting these kits together. The December box includes 8 circle dies, 27 clear stamps, 21 card blanks with coordinating envelopes in 3 different sizes, 18 sheets of patterned paper (8×8), 18 sheets of colored cardstock in complimentary colors, pearls, ribbons and a bunch of pre-cut toppers. You’ll be able to make a minimum of 21 cards! This was delivered with auto-ship through HSN as always. You can check out Crafter’s Companion website for more information. This kit is truly a wonderful bargain. Each kit offers different items and will show you new techniques. Other than some ink and glue, I didn’t need to use anything additional to complete these projects. I used a combination of tape adhesive and wet glue for most of the projects, but I also used a 3-D silicon glue to help raise some of my die cuts and toppers. Crafter’s Companion sells a 3-D glue gel that adds dimension depending on how thick you lay it on. I highly recommend this glue!!! You can add a little or a lot and you will love the results. I would also recommend the Crafter’s Companion glass mat. It is a true game changer. Once you work on a glass surface you will agree! Now onto the cards…. So far I have created 5 projects from this kit. The first card below uses the circle dies to layer in different sizes. I cut a hole in the center of the card with the largest plain circle die (not scalloped) and placed the message inside the card so you can see it when it is open or closed. I added some stamping to the other circle die cuts and a few pearls and popped up the lower left circle with the gel glue for dimension. The next card may be my favorite so far. 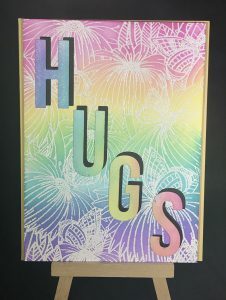 First I used distress oxide – milled lavender to stamp all over the light blue cardstock with small shapes. This allowed me to create my own patterned paper. I then cut out several scalloped circles and I also cut an offset pink triangle from the patterned paper. I layered the circles and the sentiment with the gel glue at varying heights and added a bow. In person, the dimension on this is amazing. This next card is a little different than the others. I didn’t use any of the circle dies at all. I cut strips of paper in random sizes and glued them onto a 5×7 card. I added the pink ribbon and a topper for the sentiment. This card was simple but definitely impactful. This next card is a great example of how the gel glue works…. notice the heart is raised up at the top and glued down at the bottom. I added more gel to the top to hold it in place that way….. the rest was done similar to the second card with lots of die cuts glued down at varying levels. For the last card, I made a flip card by folding back the front half of the card. I added lots of pretty paper layers and I used the smallest scalloped and plain circles. The hidden message on the inside is an added bonus. The ribbon and pearls match perfectly (of course) and really helps to finish off the card. This card may actually be tied for first along with the pink card from above. I hope you enjoyed viewing these cards as much as I enjoyed making them! As always, if you have questions feel free to reach out to me. I love to hear feedback and to see your works of art too so please do share! Until next time – happy crafting!